Please don't hesitate to fill out this inquiry form to get an instant price at the bottom for the specifications you like. We will get back to you as soon as possible with the further details to the questions you may have and with an estimate of the delivery time. We're looking forward to hearing from you! Here some options for your BC full-size guitar. There are some limitations because of neck width and such but many things are possible. Simply let us know what idea you have in mind and we'll let you know if it is possible or not. All prices include an extra high quality soft bag for your requested neck. 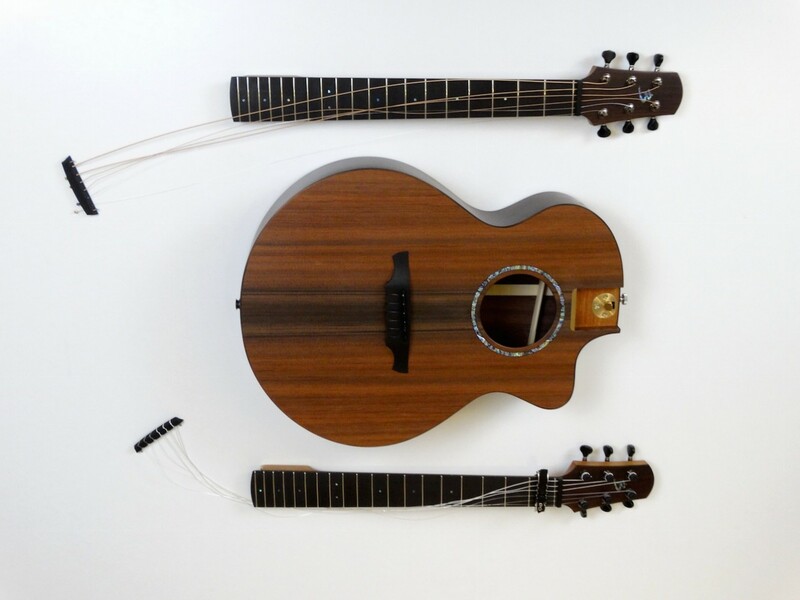 Please also be aware that we always need to built the guitar top strong enough to hold up to the neck with the highest string tension you use on the guitar. So some neck options might be risky to add to an already existing guitar that is built for less tension. We will let you know. We will assure that all necks are perfectly fitted to the body with the right action and intonation and also with a custom fitted string holder piece that perfectly fits the original bridge on the body. We offer two choices for fretboards and bridges, Ebony and indian Rosewood. Ebony is denser and havier than Rosewood and adds a little more sustain to the instrument. We offer sunbursts und colored bodies in all styles and colors. The extra money we're asking is to a good part for scrapping the bindings clear again. We usually use high end Gotoh locking tuners which are included in the base price. If you selected more than six strings the extra tuner costs are also already included in those upgrade prices. Let us know if you have any other request. All these buttons are slightly smaller fitting the smaller Gotoh tuners we're are using on the B-Compact guitars. All our guitars are shipped directly from Switzerland by Swiss Post International as a PRIORITY Parcel and will be delivered by the national postal service of your country. Each parcel is fully insured. PLEASE BE AWARE THAT YOU MAY BE CHARGED CUSTOM FEES AND IMPORT TAX BY YOUR COUNTRY'S CUSTOMS SERVICE. THOSE RATES VARY A LOT FROM COUNTRY TO COUNTRY AND YOU HAVE TO CALL YOUR COUNTRY'S CUSTOMS CENTER TO FIND MORE DETAILS. All prices are in Swiss Francs. To get an approx. idea of the grand total in your own currency you can use the converter below. Should you end up ordering your requested additional neck here some info about the payment. We accept wire transfers to our bank account or creditcard payments via Paypal with an additional fee of 3% (part of the Paypal fees). We will send you the information accordingly to your request in time.